Duo’s online insurance portal offers clients convenient solution – First Reinsurance Brokers Ltd.
Rose Avenue, Off Dennis Pritt Rd.Kilimani, Nairobi, Kenya. Calleb Karegyesa and Prashanth Srinivas run an innovative business that sells insurance covers online. It’s like Uber for the underwriting industry and just like the famous cab-hailing service was destructive in the local taxi scene, their firm is fast changing the retail insurance business. Their firm, Pesabazaar, an online insurance agency, is less than a year old and has already sold about Sh80 million in gross premium since their April 2016 launch. 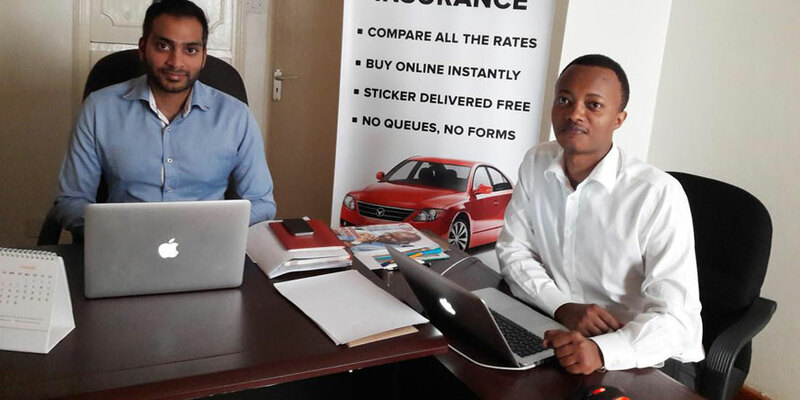 In an industry dominated by brick and mortar insurance agencies, the two entrepreneurs have taken advantage of Kenya’s Internet penetration to offer customers convenience. To access their health, motor, life, education, home, travel, golfers, professional indemnity and personal insurance products from a variety of the top and middle-tier insurance companies, their customers simply need to go to their portal. “The value proposition we give our clients is transparency and convenience,” says Mr Karegyesa, 27. The insurance companies whose products they offer include Jubilee, Amaco, UAP, Occidental, Britam, Kenya Orient and AAR. The majority of their income is generated through insurance commissions similar to those of traditional insurance agents. However, unlike their competitors, they have fewer overhead costs, making their business that much more profitable. “Sales and marketing are our biggest overheads. It was one of our challenges for the business, getting people to trust us enough to buy their insurance online. We launched the portal in March, but didn’t get our first client until August. It was a referral. He bought golfers insurance,” said Mr Karegyesa when Digital Business stopped by their office in Westlands, Nairobi. Mr Karegyesa adds that the beauty about running the business online is that an increase in sales volumes does not directly translate to an increase in salespeople, therefore expenses, as is the case with traditional insurance agents. “We started with a staff of four, but the number has marginally grown to 12,” says Mr Karegyesa. But their success is not all about being among the early adapters of the online platform. The two techies have a business acumen to back it up. “[After studies] I got a job with Barclays Bank and Prashanth with UBS,” says Mr Karegyesa about joining the corporate industry in the UK after graduation. It was particularly the exposure at the bank that opened his eyes and sparked the idea for Pesabazaar having seen the efficiency and convenience afforded by online banking and insurance products. To endear themselves to customers, the firm strives to provide topnotch customer service. “If it’s the sticker for motor insurance and you are in Nairobi, we will deliver it to your location in less than 24 hours. If you are outside Nairobi, we will work with the branch office nearest to you to have the sticker delivered,” says Mr Karegyesa. It is through the combination of good customer service and business knowledge ridding on the digital platform that the firm has seen its business volume increase gradually over the last six months. On average, Pesabaazar sells between 200 to 300 policies a month. The value of the written premiums for these policies varies between Sh1,500 to Sh200,000. Motor vehicle insurance cover sells the most and the highest commissions come from health insurance. Between 1,500 to 3,000 inquiries come in every month through the portal. Pesabazaar’s impressive growth trajectory has not gone unnoticed. Last November, it was awarded as the Best Innovative Company 2016 by BIMA Intermediaries Association Kenya (BIAK), a lobby group for insurance agents in Kenya. Mr Mr Karegyesa and his partner met in the UK – at the University of Southampton – where they had both enrolled for their undergraduate Electrical Engineering studies. During their stay in UK they noticed that consumers didn’t transact directly with insurance companies or with banks. Agents and brokers were contacted at the point of, say, filing an insurance claim. In fact, they were more of retail risk managers than agents and brokers. Every other stage of buying insurance – from inquiries to comparing quotes from different companies to payment – was done online through portals and on email. They decided to export this model home. “Our starting capital was $400,000 (Sh40 million),” says Mr Karegyesa. First Reinsurance Brokers Ltd was incorporated and registered in 1993 as the first REINSURANCE Broking Company in Kenya. FirstRe is a wholly owned subsidiary of Pacific Insurance Brokers (EA) Ltd. Our growth performance reflects confidence by the market and quality of service delivery.